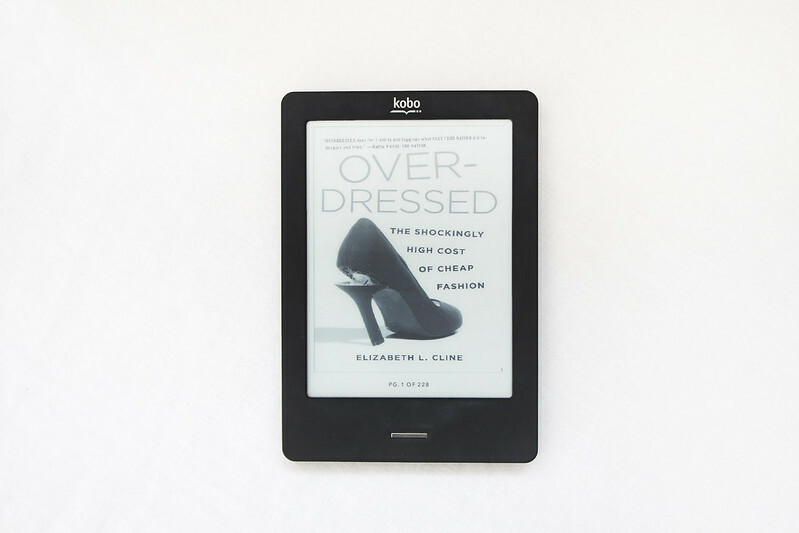 'Overdressed: The Shockingly High Cost of Cheap Fashion' is the result of a three-year investigation by Elizabeth Cline into "fast fashion." The book explores typical consumers of cheap fashion and how the fast fashion industry of producing high volumes of low quality clothing has fundamentally changed the way we shop and dress. This quantity over quality system where profit for retailers is driven up and value for money is marginalised, has turned clothing into disposable goods that damage not only our environment and our economy but also our society. Chasing trends has become a mass activity, a hobby accessible to anyone with a few pounds to spare as a result of low prices. Quality is no longer a concern when we are encouraged to regularly discard clothing when the next trend in fashion comes around. Consumers are encouraged to renew their wardrobes every few weeks by chasing trends, buying cheap, and rejecting the traditional values of the fashion and clothing industries. Cline offers a solution to the consumers who want to break the "buy-and-toss" cycle, she encourages us to "make, alter, and mend" our clothing, alongside shopping secondhand and supporting independent designers. What I felt 'Overdressed' lacked was a more indepth analysis of why consumers have become hooked on fast fashion, whether this is symptomatic of a larger issue and whether social media including blogging and YouTube (which Cline does explore briefly) has encouraged and altered our shopping decisions. I also felt the middle ground was ignored; where are the fairly priced, good quality clothing options? I feel Cline would have us believe there are only three choices: fast fashion (extremely cheap), high end fashion (extremely expensive), and recycled second hand clothing. 'Overdressed: The Shockingly High Cost of Cheap Fashion' is a good starting point for anyone wanting an introduction to fast fashion and its consequences. It makes for light reading due to Cline's relaxed, informal writing style and raises some interesting points. Wow, this book sounds great. I like the whole idea of consumerism, so this books sounds like it's right up my alley. I can't wait to pick it up. Thanks for the great review! I saw this book not too long ago and contemplated reading it. I am not big on fast fashion and I get exhausted from seeing the same items everywhere, even if each owner gives it it's own touch. I feel like everyone just wants more and right away, regardless of the quality of the items they get. Why would one spend more money, invest in good household items - because one might use it for the next 10-20 years to come, and yet when it comes to clothing refer to low quality items. Is dressing up less important than having lavish furniture? I live by the principle my mom raised me: "It's better to own few clothing items, as long as they are of good quality". And that doesn't mean just wearing high end fashion. There are smaller brands, local brands even that use good/natural materials to produce their items. I think we as shoppers need to be more conscious of the things we buy. If you won't eat non organic food, then why would you wear cheap (toxic) clothing? Just like for food, we need to to read the labels when shopping for clothes too. Thank you for this review, I think I will go ahead and get myself a copy. I feel like there's danger of a certain amount of snobbery & class disdain within the idea fast fashion is irresponsible. Cheap fashion like Primark might be unethical but for many people they offer the luxury of being able to affordably buy a number of clothes/keep up with fashion when there are few affordable, accessible alternatives. In addition, if we're talking high street, for example, there is no evidence shops like Urban Outfitters or Topshop are more ethically sound let alone some high fashion. Mending/altering clothes are becoming lost skills and along with shopping vintage are more the reserve of those who have the time to invest. I feel like it's an aspirational thing, in a way, ethical fashion, which needs to extend it's ideology. Hopefully in time! This is the great book . I like this .I am really happy you posted this .Thank again for your post . The thing is, people say they cannot afford to buy "expensive" clothes and then regularly pick up £5, £10, even £20 or £30 dresses, jeans, coats, and shoes. The book talks about this attitude towards clothing and explains how, if we stepped back and looked at how much we spend over the year in "cheap" trend based clothing, we would realise in reality we could afford to buy fewer items that are high quality at a more expensive price and not actually spend any more money than if we had purchased a lot of cheap items that we eventually throw away. I really believe consumers need to realise how "buy-and-toss" greatly impacts our environment and society. It's an unhealthy attitude to have; everyone wants something for cheap without taking notice of the effect it can have on our lives in the long run. That is way more important than "looking the part" and dressing in cheap fashion trends. I feel exactly the same way. I have a 'series' on this blog about how I am trying to buy fewer items at higher prices. I never really purchases fast fashion clothing items but I definitely succumbed to buying cheap clothing, I think we are all guilty of that. I want my wardrobe to be minimal but stylish and functional. I want my clothes to last a long time. It's a great book and I want to read more on the subject. I hope you enjoy reading it! Glad you enjoyed it - let me know what you think about the book! Yes, we are all guilty of that. I didn't think to much about quality vs quantity when I was in High School but as I grow older, I really do my best to stick to the quality part when clothes shopping, even if that means shopping at some small unknown brands. PS: I have been going through your blog and really like how well curated it is! It's a pleasure to read! I, for one, think that YouTube and blogging has definitely influenced people into becoming fast fashion addicts. I mean, I see it almost every day when I'm catching up on my blog reading, Instagram feed and YT To Watch list. People are spending hoards of cash on clothing that looks cheap and IS cheap. I always end up thinking to myself: "Dude, you could have saved yourself A LOT of money if you had just abstained from visiting stores like Primark and H&M every damn day of the week." Everyone's become obsessed with trends and fast fashion to the point where I'm starting to find it sickening. It's scary. This sounds like an interesting book and I need to check it out. I've become interested in ethical and fair trade fashion over the last year, and I'm actually doing a month-long challenge right now, wearing only six pieces of clothing for the entire month, either thrifted or made in the United States, where I live. It's an interesting experiment, and I've made a conscious effort to buy only from brands I know and trust that are ethical. It can be more expensive at times, but I'm committed to finding clothing options for myself and my family that don't hurt the people who make them. I'm also realizing that I can do without the quick thrill of fast fashion in favor of fewer items that last longer. Oooh, I'd love to read this! I've been going through a major overhaul of my wardrobe lately and getting rid of everything a) that doesn't fit, or b) hasn't been worn in ages. The goal is to cut (most) ties with fast fashion and build a wardrobe of quality items made from natural fibers. I don't know what brought about the change but something clicked recently and I could no longer stand the idea of buying another cheap polyester/acrylic shirt!